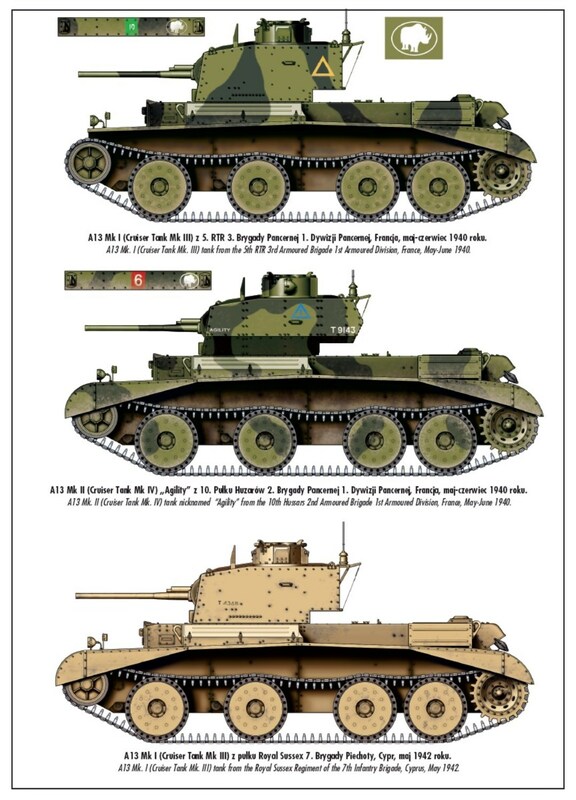 The A13 was an important step in the development of British tanks since it was the design which initiated the long run of Cruiser tanks with Christie suspension produced in the World War II period by the British. Essentially it stemmed from the designs developed (largely unsuccessfully in his own country) by the American designer J. Walter Christie. Responsible for the introduction of the Christie suspension into British tanks was Lt Col G. Le Q. Martel, one of the pioneers of British tank development in the twenties, who was appointed Assistant Director of Mechanisation at the War Office in late 1936, and as such was in charge of AFV development. In September] 936, soon after appointment, Martel attended the Soviet Army autumn manoeuvres and was much impressed by the speed and performance of the BT tank, which the Russians had developed and put in service in large numbers after buying some of Christie’s prototypes. Returning to London, Martel expressed the opinion that a tank of vastly superior performance to the A9, then under development (qv), could be produced by adopting the Christie type suspension and a powerful lightweight engine like the Liberty used in Christie’s prototypes. Funds were granted to buy two Christie vehicles, the first arriving from the United States, accompanied by Walter Christie, in the following month. Morris Commercial Cars Ltd acted as agents and licensees for the transaction and the vehicle was delivered as a “tractor” without a turret. The basic Christie chassis design incorporated compression spring suspension and large-diameter road wheels which could run either with or without the tracks. Trials led to the decision that, as far as the British were concerned, the “trackless” running facility could be done away with as an unnecessary complication. Also the Christie hull was too short and too narrow to take any existing (or contemplated) British turret. The power-to-weight ratio of the Christie design was 2 1/2 times better than the best existing British design, however, and it was decided to utilise the suspension but build a new chassis 5tin wider and 10in longer, to take a 2pdr gun and turret. At the end of 1936 funds were allocated to build two prototypes, and Morris Commercial Cars Ltd were asked to undertake detailed design. The original Christie vehicle was now designated A13El and the two British-developed prototypes became A13E2 and A13E3. The Liberty engine (an American World War I aero type) was adopted as standard, as in the original Christie vehicle, and Nuffields, an associate company of Morris, were to build it under licence. Al3E2 was ready for trials in October ]937 and there followed a period of tests in which many mechanical problems were revealed, mostly due to the vehicle’s high speed of over 35mph. Modifications included governing the speed down to 30mph, altering the clutch and transmission, and using shorter pitched tracks. By January 1938 most of the problems had been overcome and a production order (provisionally set at 50) was confirmed for 65 vehicles. Trials with A13E2, now joined by A13E3, were continued and further detail modifications were made to fittings before production was started by Nuffield Mechanisations and Aero Ltd, a company formed specially for munitions work by Morris. Deliveries started early in 1939, and the order was completed by Summer 1939. No further orders for this type were placed, since progress was being made with developments of the A 13 design. This vehicle had taken only just over two years to get from inception to production status, a remarkably swift development for the period. These Cruisers Mk III as they were known were used by 1st Armoured Division in France in 1940, and (in small numbers) by 7th Armoured Division in Libya in 1940-41. 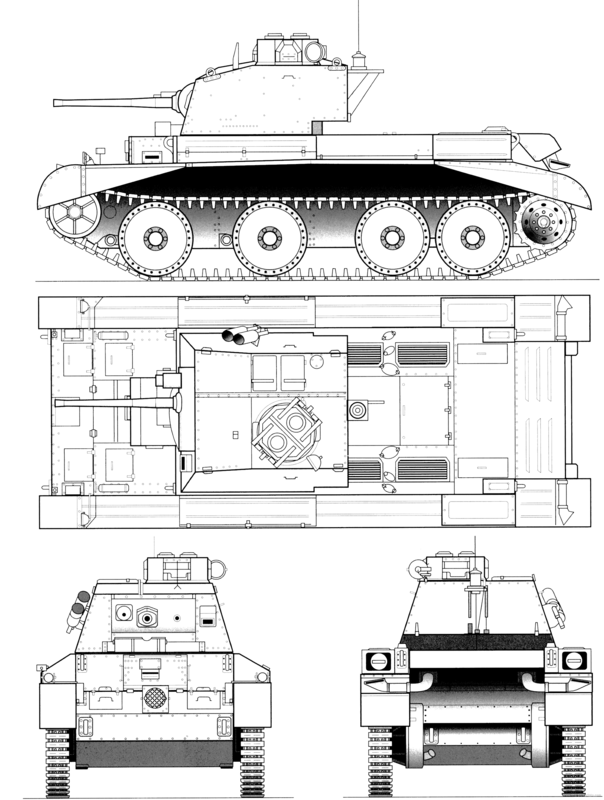 The Cruiser Mk IV was essentially an uparmoured version of the Mk III and did, in fact, have the ordnance designation AI3 Mk II. It followed the Cruiser Mk III in production and arose from a decision taken in early 1939 to increase the armour basis to 30 mm for cruiser tanks (for full circumstances see next entry, Covenanter). One of the A13 pilot models was accordingly reworked with additional armour to bring its thickness up to 20-30mm. Due to the high power-to-weight ratio of the basic design, there was little adverse effect on performance even though the weight was increased by more than I, 200Ib. 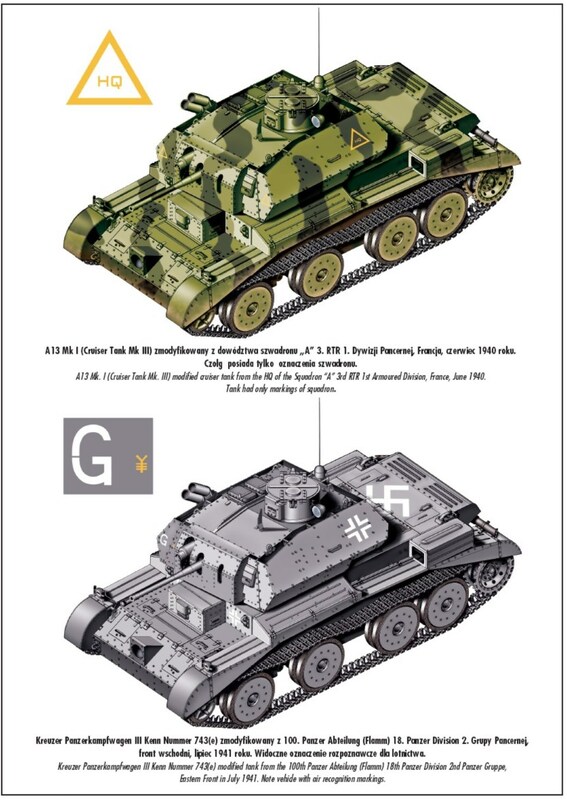 The extra armour plating was mainly on the nose, glacis, and turret front, but another feature was the addition of V-section armour plating on the turret sides which gave the “spaced armour” effect later widely used on German tanks. This resulted in the characteristic faceted turret sides, the feature by which the Mk IV could be most easily distinguished from the Mk III. Nuffield undertook main production of the Cruiser Mk IV after Mk III production had been completed, starting in 1938. Some Mk Ills were reworked with extra armour up to Mk IV standard and were externally similar, distinguished only by the early type mantlet as fitted to the Mk III. Mk IVA was the designation given to later production vehicles which had the Vickers co-axial machine gun replaced by a Besa. There was also a Mk IV CS which had a 3·7in mortar in place of the 2pdr gun. Only a small proportion of vehicles were of this type. 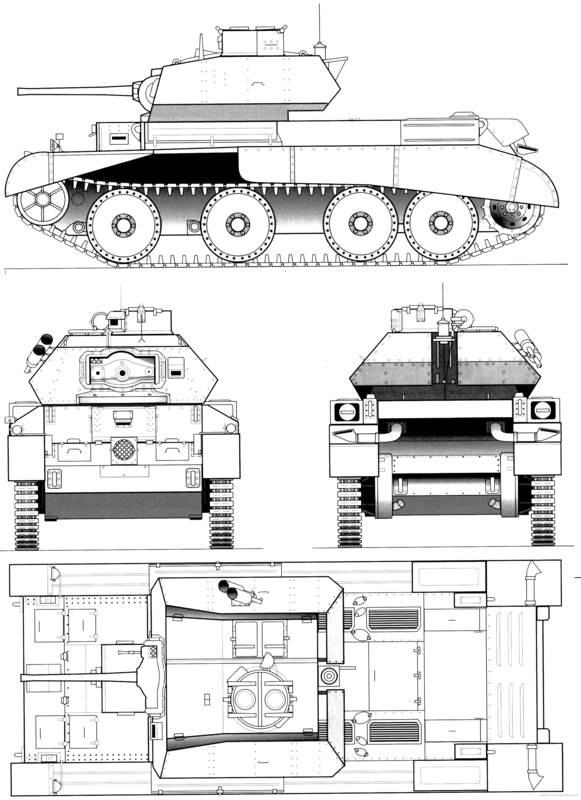 Some vehicles had an armoured cover over the mantlet, and others were reworked with an armoured extension (heading picture) which completely concealed the mantlet. 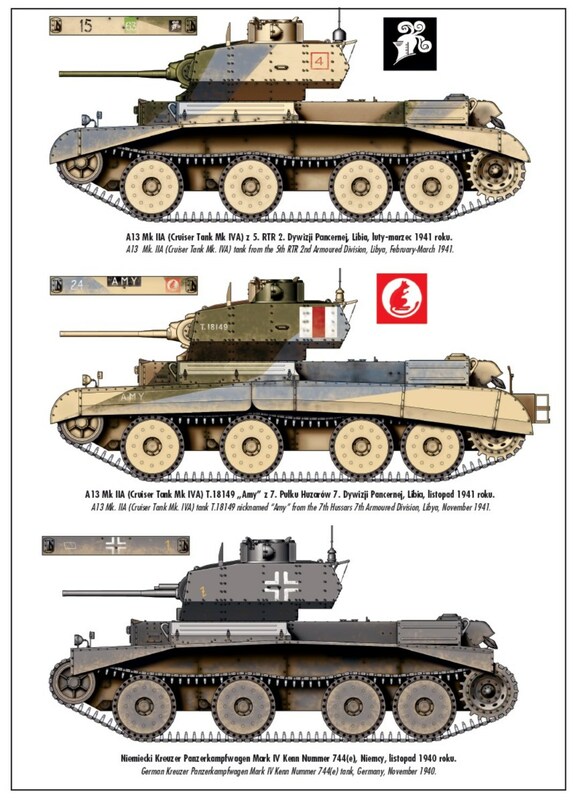 Cruisers Mk IV were used in France by 1st Armoured Division, 1940, and in the Western Desert by 7th Armoured Division, 1940-41. They were also used for training in Britain. 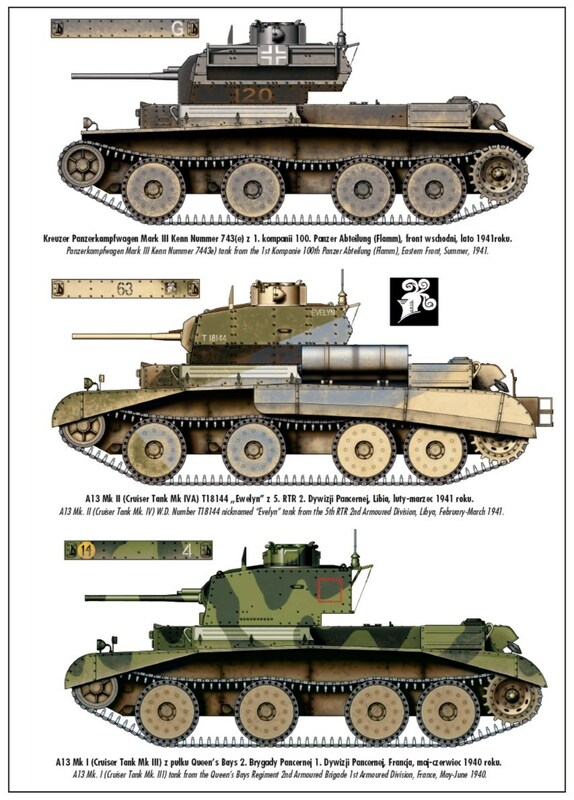 Total production of Cruiser Tank Mk IV series vehicles amounted to 655. Additional orders in 1939-40 were placed with the LMS, Leyland, and English Electric (200). This entry was posted in AFV, British by MSW. Bookmark the permalink.